Just got this in. 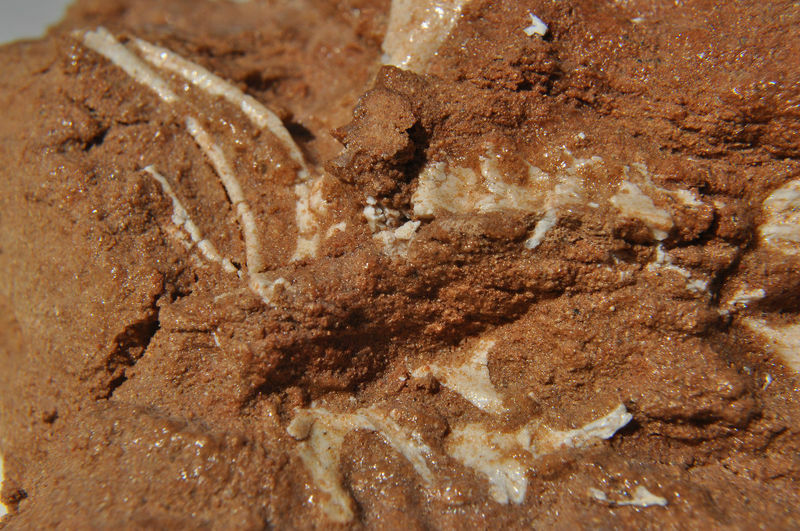 It is from Mongolia and is Cretaceous. No Further ID. Anyone? can we get a close up and flipped (left to right starting with cranial) photos please. Rock material does look like some of the material from China but not sure cant see the bone well enough to judge reptile or not. I assume thats all the info you have, no stratigraphic information? Congratulations on a fabulous fossil Frank! Very interesting find. Are you going to clean it up any? Wish I'D been there. This was a purchase. Will try to get better pics posted tomorrow. It is pretty. 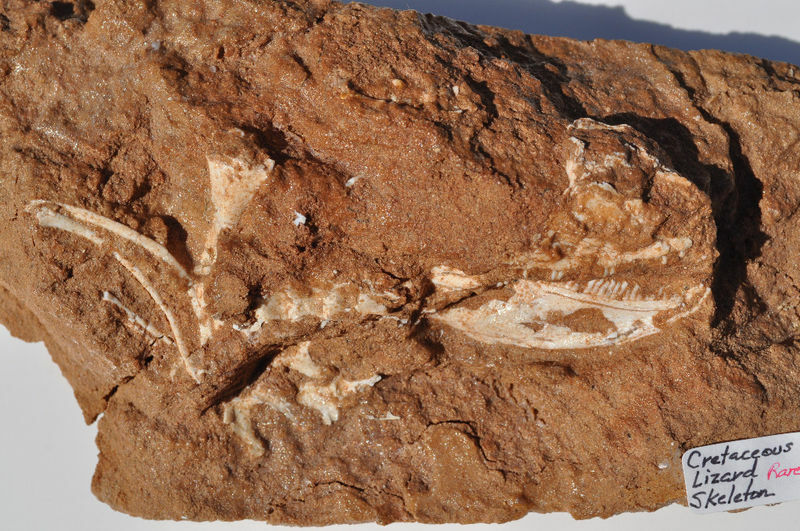 Just be careful with Mongolian fossils (same for Chinese): Although it's perfectly legal to buy and sell them in the US, it's illegal to remove them from Mongolia/China - so while you're free to buy it in the US, be aware that someone broke the law to bring it here. Well, it's a big lizard (photo is low res but the teeth appear lizard-like) and that matrix does look like the rock that also yields some Mongolian dinosaurs (oviraptors, ankylosaurs, Gallimimus). You can try consulting a faunal list based on that. I don't know how well-documented the lizards are from there. I do know the bone from there is extremely fragile relative to the matrix, so if you're thinking about further prep, you better be really good at it already. The matrix on that particular specimen looks like it already has a ton of glue on it so you will want to carefully apply acetone to spots around where you want to expose more of the bone and then use needles or scalpels to gently scrape away the matrix. If you're really good with a scribe, you can use that but a micro-jack is the better move for fine work which is what is needed for that piece. I would not try to clean individual teeth with a scribe. that thing is completely illegal! looking at that fossil makes me angry. if you bought it, then im really upset cuz i know that you know better! i know its hard to resist to have something like that in a collection. however, someone broke the law to do that! they snuck into government-owned property, stole the fossil out of the rocks, broke a lot more in the process, sold it to some 'clueless' foreigner for some $, and they're going to get more! and break more! more more more for the sake of money! this isn't right! this should all just stop. frank, those illegal thieves dont...care...about fossils. they also don't give if they encourage people to do more illegal digging. buying these from them encourages them more. but since that you already have the fossil... and since that it's too late, just take care of the fossil and good luck with it. 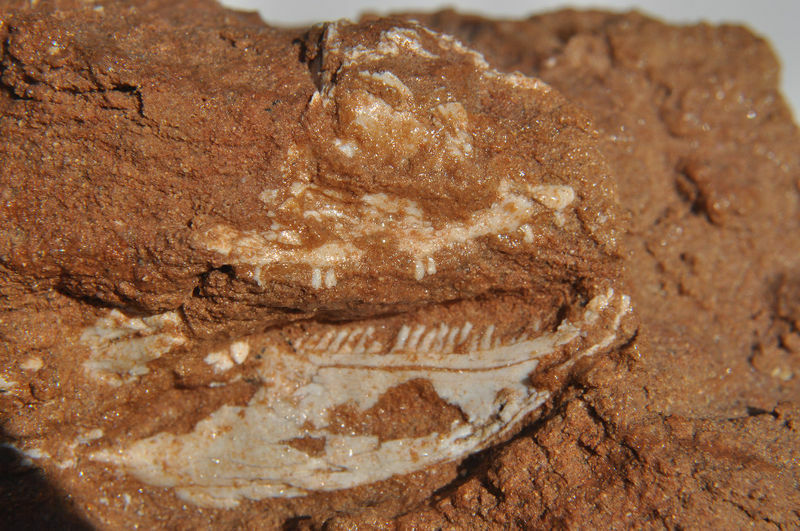 please do hope that it isn't a new discovery or species or a very important fossil, or else the chinese government (if inner mongolia)/mongolian government (outer mongolia) will request it back. I know this fossil has changed hands at least once in the USA before it was aquired by a dealer who has an impeccable reputation--who I have done business with for several years. A lot of the illegal issues have to do with when it was taken from China and by who. Sometimes they have allowed dealers to sell, sometimes government officials sell. This issue has come up before on the forum. Here are some more shots. The matrix is a close match for Dinosaur egg material I have. 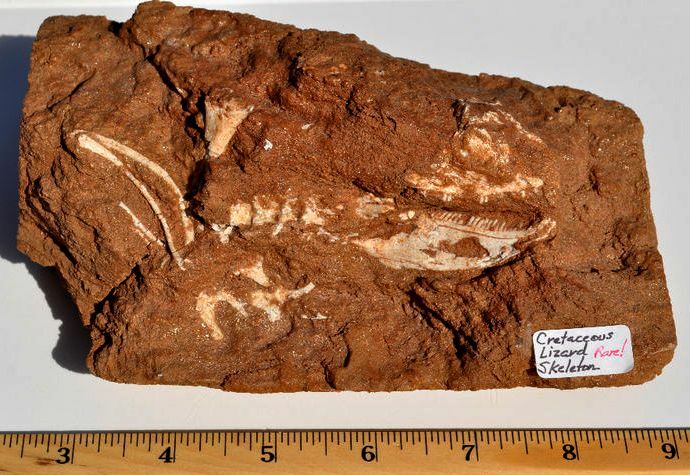 Nothing is accomplished trying to litigate the provenance or legality of this fossil. Without the actual field collection data it is impossible to say with specificity what, when, or where with regard to this specimen. Frank has hit the nail on the head pointing out the fickle attitude and stance about the fossil trade in China and Mongolia. By definition the laws and remedies are quite severe, yet there are scores of dealers who have been operating for many years without fear of recourse from the government. Truth be told, those types of pressures are selectively brought to bear when a scapegoat is needed for a sensational news story. Everyone else continues to do business, either in the light of day or in the backrooms of the major fossil conventions. Good old MOOLA is the determining factor always and a quick tally of prices fetched for some of these fossils indicates there is plenty to go around for all. (not Capricious)I don't beleave they would be tollerated selling openly. In the case of this fossil, I purchased from an Amerian, who bought it from another American. I do not know its history before that. Plese excuse my bad typing. I am having a Gout attack and am reduced to using one finger. as long as you know what you're doing frank, then i believe in you. So, new pics posted. Any ideas of what this is? Found these online - Dont know if they help. Second PDF looks vaguely similar - I'm having trouble with the orientation here - not sure if that is the lower jaw or upper jaw/skull that is mostly exposed.  Link #1 : Scroll down midpage to open and view/save the file. I apologize if you've already found these. much appreciated. i am down to one finger typing right now, so prowling the net for anything is difficult. even if it isn't that, i get a new reference site! looking at this, i am inclined to agree with an iguanid. the pictures are top side up. the bare patch in the lower jaw certainly creates the illusion of an eye socket but it isn't. Rôôôôôhhh ! Your 1st link doesn't want to work ! i connected with the first, but foundthe second link to be much more useful. It is still working fine for me. The link brings me to a page, then scroll down to where it says open/view the file. That one works for me as well. The link brings me to a page, then scroll down to where it says open/veiw the file. Today still it doesn't want to work. Too bad !